made by the Red Plate Store. This pattern was used by the Kansas City Southern Railroad from 1934 to 1969. Roxbury is a city in Kansas. 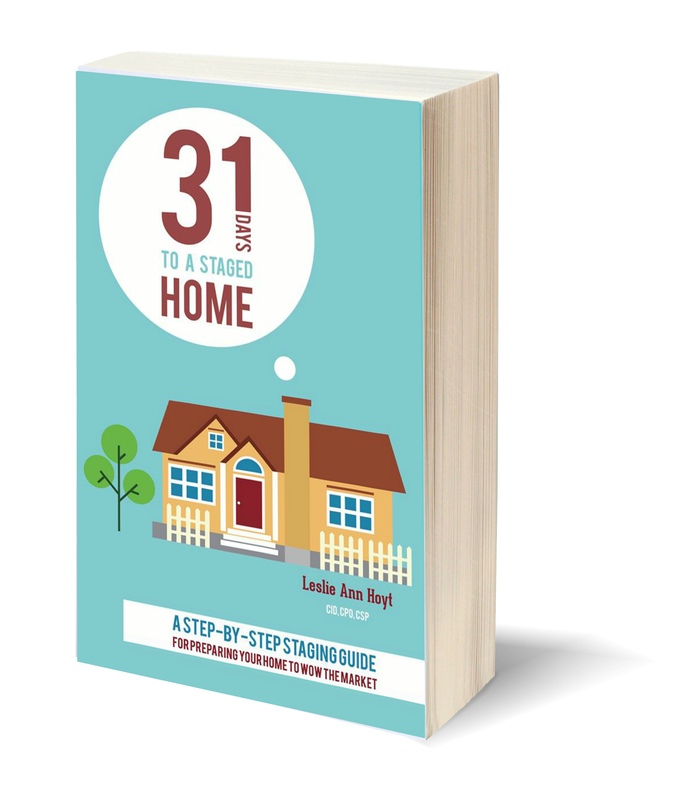 in her home, and I greatly admired it. with all of it, tucked in some towels in a laundry basket. She treasured me, and brought me a gift! I treasure my family more. I treasure my friends more. We are more valuable than the sum of our "things". Our things don't last forever. Our lives don't last forever. Only what we do for Christ lasts forever. What can we do for Him today? and show it with a kind word, or a hug, or a little email. go check out all the other wonderful vintage thingies! Your post and that verse is a great reminder to watch our priorities in life. So often we get caught up in the 'things' when really none of that matters. Our relationship with God matters as does our relationship with each other. 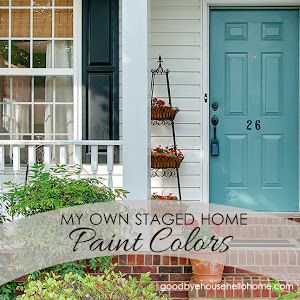 An especially beautiful blog today. It helps to put it all in perspective. Your blog is an inspiration. I have been thinking of starting my own! And love the dishes! Well, Amen to this! 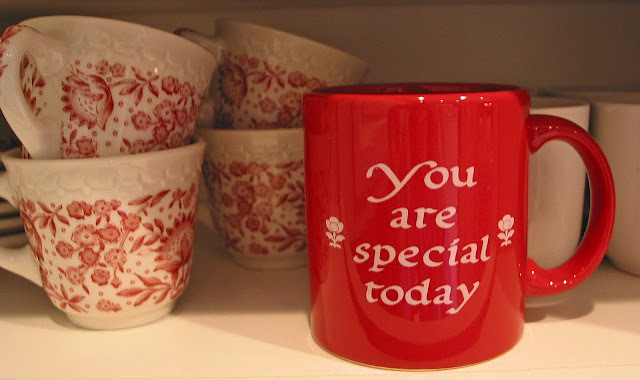 I love those "You Are Special" dishes! I wish that I could have had something like that as the girls were growing up. What a wonderful gift your friend gave you! Not only are they beautiful (I would love them too), but every time you look at them, your friend is saying "YOU are special." I love that. What a sweet post. You are correct; we need to remember to treasure those who are dear to us more than ‘things’. 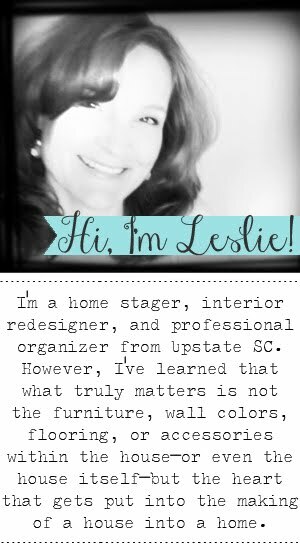 I’m glad I found your blog, as you are a treasure too! And? I l. o. v. e. those dishes. Swoon. Well said sweet lady. This is such a wonderful and sweet post. Your blog is becoming a treasure for me. Leslie, you have an amazing way with using your words for the Lord. You mix together beautiful pictures, a sweet story, a fabulous message of uplifting others, and the love of Christ so seamlessly. I love reading your blog! Leslie, I love your post. That is so true that we need to treasure people more than things. We have a special plate too!! The Syracuse China plates are beautiful as well. My uncle worked for years at Syracuse China so it always makes me happy to see it and that it is becoming so popular now. 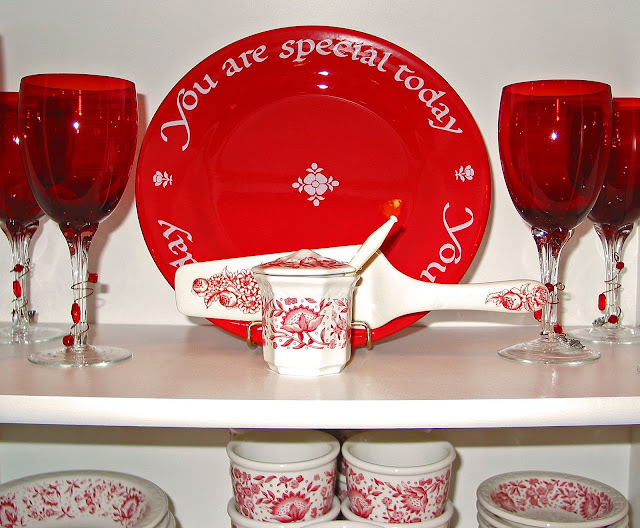 Oh, I love those red plates and the little history that you shared with them!!! What a great reminder to adjust priorities and focus on people. It's so easy to get hung up on the material instead of the eternal. I am thankful for you. Miles away and a sister in Christ whom I have never met. You are a blessing to me! I have the same red "special" plate and we have the same tradition at our house. I don't have the cup. I found my plate at a thrift store a long time ago. 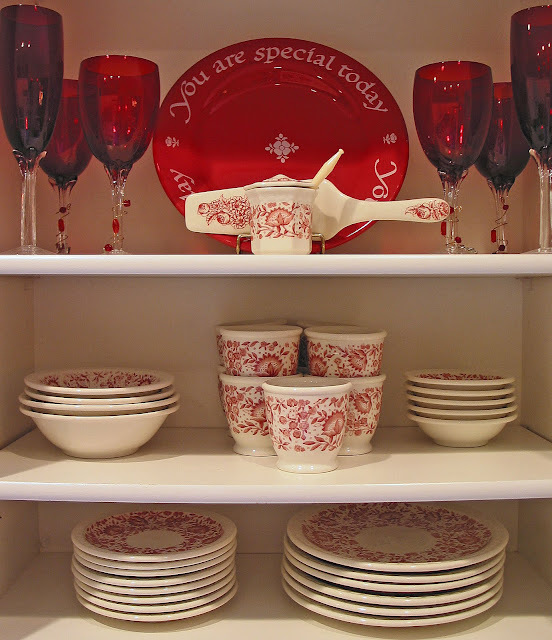 What a great friend you have to give you those beautiful dishes! They're to die for! Very nice post. And while I adore your china, you are right, it's the people we should adore more, not things. Thanks for bringing us back to the truth. Thanks! What a sweet friend and sweet tradition. 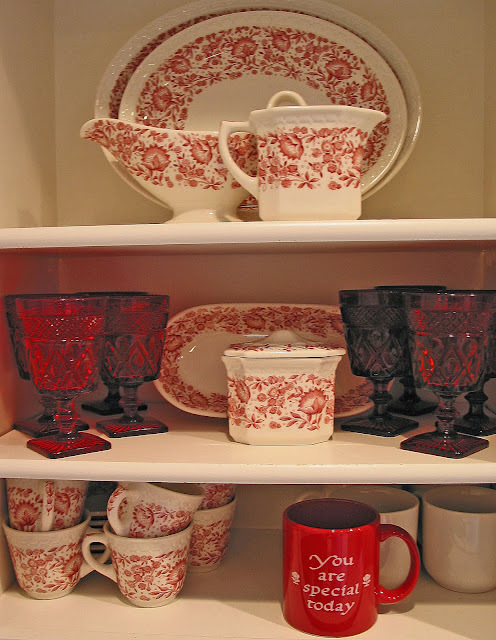 Your transferware is so very pretty. What a great post! I simply loved it! And well, those dishes are amazing!! What a wonderful gift. Have a great VTT! Very pretty items! Happy VTT! Thank you for sharing this beautiful set as well as the reminder regarding our priorities! Have a great day! This was a most wonderful,loving post today..and I so enjoyed it. The dishes are gorgeous,but the gifting itself and the love that went with that gifting,is far,far more beautiful than the dishes. I love old Syracuse china, and they just don't make china like they used to! Your set is just lovely, and what a wonderful thing for your friend to do, presenting it to you. And I've always wanted one of those special plates. I keep hoping to find one at a garage sale, but I don't think that's something that people would ever get rid of, so I guess I better buy a new one! Your friend blessed you that day with more than some beautiful china. Love the idea of the plate too. Hi! I missed a few posts from last week. What a fantastic set! I've never seen a "whole" set before, just bits and pieces. You sure are lucky to have them and to have your friend! Well that is one very special friend. She gave you two very beautiful gifts: her antique dishes, and her friendship. I'm so loving that china. No not more than the people, but well....ummmmmm..a little close? lol. I've been on the hunt for that type of china now for years. I've got me two small plates thus far..lol. Beautiful dishes and beautiful thoughts. Thanks. Such pretty dishes but oh my, what a friend to know you loved them and to give them to you - she is the greater treasure! I think that your family is very loving and thoughtful. I like the message as well as the china. I'm a new follower and thanks for sharing. I have heard about using one of these special plates and I do think it is a wonderful idea! I love your set of dishes too. What a thoughtful friend!! !